An album of resistance to oppression in armed and peaceful forms. Articulate and personal, it is peppered with tragedy but is in essence celebratory of family and the personalities whose stories are within. Daria Kulesh returns following her debut album “Eternal Child”, an album that was bathed with a kind of autobiographical style and promise. A sleek black and pink affair (still love the photography and artwork) it touched on her eastern roots and ventured on a few flights of magical realism and fancy. “Veil folk” might be an appropriate term for the type of music with it’s strongly emotive numbers coupled with some supernatural and historical elements. On listen it felt as if the veil of reality “has been shaken” somewhat, hence my attempt at genre. Listeners might have also encountered Daria through, of course through the band KARA (where she sings vocals and themes influenced by both Russian and English elements), she does seem to have kept herself busy. In KARA she released the excellent, briny foray into the sea with their last album, “Some Other Shore” see my review here, but this time however she is going solo. I say solo, but she is joined by a prominent roster of artists (too many to mention all) including Jonny Dyer (guitar, piano, bouzouki, accordion, bass), Terry Crouch (classical guitar), Kate Rouse (hammered dulcimer, vocals) and Vicki Swan (myckelharpas, Scottish smallpipes, flute) who along with others bring enough instruments to satisfy even the mildly curious listener. With several tools and sounds that I have heard before (and some that I have not), the artist has pulled together a large army of melody to convey her personal message. Kudos should be given for the breadth of sounds considered and the inclusion of instruments from Ingushetia, the focus place of this album (a Dakchan pandar, anyone?) “Long Lost Home” is not just a trek into a faraway land but also a ramble into the living memory of tradition and customs. 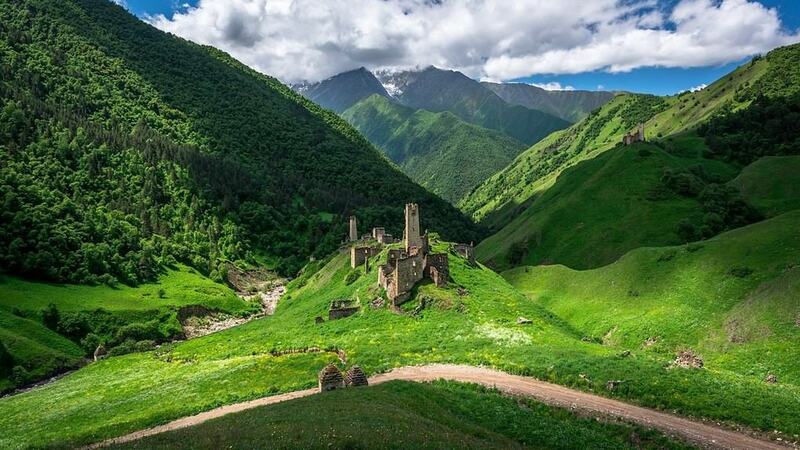 So the culture and history in question is centred around Ingushetia, a republic in Russia’s south. 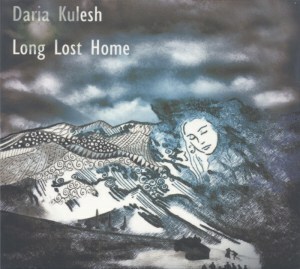 In the background of the album there are some major historical and political events that shape the stories within, including the deportation of the Ingush and Chechens by Stalin in 1944, and also war crimes of the time.”Long Lost Home” is capturing the past and also is a personal theme as Ingushetia was the homeland of Daria’s Grandmother, Fatima Akhireva. She experienced the tides of history, issues of exile from their home and a lot of hardship in her life; it might be considered enough to stop here but Kulesh goes further back to collect stories that her Grandmother had from generations before, quite a fear. Kulesh wants to explain and remember what has happened, but equally importantly it is her chance to show a few glimpses of the powerful, stalwart personalities in her family and how they have weathered difficult times. For a subject it is pretty intense stuff but also fascinating from the perspective of someone not knowing the smallest bit about this part of the world and it’s histories. It is natural to think that the times we live in are the worse they ever have been (if you are a pessimist of course), but albums like this are quite useful in reminding us of harder circumstances and oppression. From the album artwork we can see the artist has fully immersed herself into the sounds and sights of this ancient homeland. 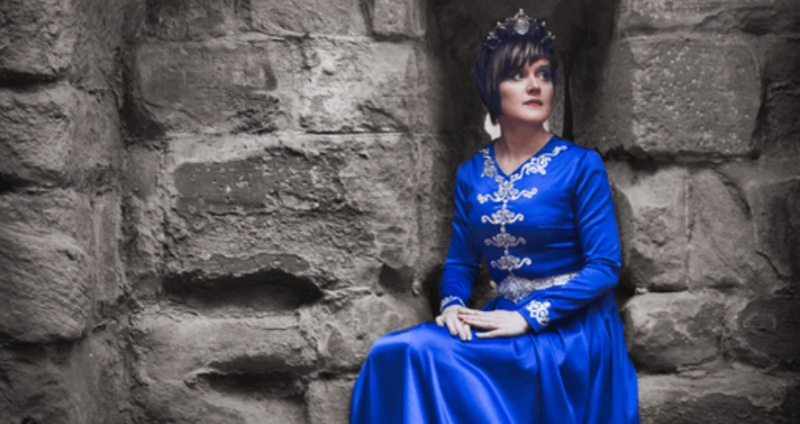 Kulesh travelled to Ingushetia to gather the stories and in the sleeve we see her in the traditional dress of fine deep blue. There are also photographs of family and characters that help us put faces to deeds quite effectively, it is quite beautiful in this regard. So how is this communicated by the songs within? In the opening track “Tamara” there is a deep sense of the album arising; the song fills the senses with the sounds of the shruti box like a serpent waiting to strike. Like the wind scaling the jagged rocks and heights, it is the track which most resembles her previous work of taking myths and legends and giving them a classical treatment. In the song her Grandmother’s ancestral village and the ruined tower stand at the centre of a storm torn vista of shivering antiquity and wonder; the percussion rattles and jingles giving it an otherworldly air and Kulesh’s voice furrows a winding and enticing path. The tribal drums sounding drums here give “Long Lost Home” an almost spectral opening to an album, looking back the furthest of the songs and setting the scene for the human stories within. “The Moon and The Pilot” is either the most well-known of Daria’s songs to anyone reading this or it will soon to be to new listeners. Previewed in various formats between this and her last album release it has had some coverage (and with good reason). Telling the story of her Great Grandmother Diba Posheva (the Moon) and her husband of the sky (Rashid Akhriev, a pilot who is killed delivering supplies in 1942 to Leningrad) it teaches that heroic deeds are not always recognised, and even when they are as here, circumstance and the world can step in and at the drop of a hat lead to a catastrophic change. Akhriev was due to named a hero, but Stalin then declared the Ingushetia people as “enemies of the people” (despite fighting against Hitler). A lyrically simple song but the piano is quite captivating and Kulesh’s voice reaches for the very vestibules of the soul, “Shine my moon, your face made of light. Let down the your hair, black as the night”. It dances like the queen of night under a halo of glittering crystal and stardust. An excellent track indeed. Track five, “The Hazel Tree” is a great song that harkens back to the artist’s Grandmother’s Grandmother. It is strength of the album that as it trails back along the earlier paths of Daria’s family tree it makes you think of your own history, the stories within and the strength among one’s own kin. It seems like it must have been a series of big discoveries for Kulesh when curating these narratives. An upbeat song, the guitar work on this album is energetic with the “Hazel Tree” of the title seeming so close and full of radiating life despite the words pointing towards the tree being a final burying place for the subject, “You lived again, and blossomed and bore sweet fruit.” It sure is a spirit affirming number, its sense of wisdom, humility and resilience in the person described shines in plain sight through this song, making it an essential listen on the album. Not only is there resilience, but also resistance. “The Panther” (Track 7) about Laisat Baisarova, a sniper and officer who went vigilante in protest against orders to deport and kill her own people. There are some good lyrics here, Kulesh reveres The Panther’s power and rebellion in the face of injustice, “An Amazon doesn’t serve. In an army of slaves,” and her voice lingers and dances around the classical strings quite elegantly. The defiance of this interesting woman burns within the song like a fire nestled against cold, snow-buried stones. Characterful, Daria’s voice has a slight snarl to start and then becomes light and compassionate as the song (uncharacteristic for folk) develops into a positive ending with her never being captured and possibly becoming of less renown because of it. An inspirational character and a pointer to strength of noble conviction. Other songs that point to Kulesh’s pride in the people and the place include, “Safely Wed” is certainly a balmy, rich, heady song in celebration of an “Auntie Nina” and a Matriarch exercising some prudent wisdom with family affairs and “Like a God”, an urban, gladiatorial wonder of a song with the main character Alaudin (a doctor) fighting against Stalin and a cut-throat world of bandits with the steel of his scalpel, “leading them a merry dance, on a floor of snow and blood.” There is steel in these notes, there is iron in these words but as shown, it is not always shaped into a gun. Folk fans who like a more classical voice, a respect and inclusion of cultural instruments, and a sense of family will instantly love this album. It is a personal concept album in the most part, Kulesh does actually move away from the core concept for a track or two (“Untangle my Bones” and “Gone” being the main examples”) but they are needed, they show an artist who is trying to convey what the sum of her research and experiences have triggered in herself. In sound arrangement it is musing, capturing the minds eye as it races to the East in search of mystery and a strong, personal album that moves slightly away from Kulesh’s magical realist music and more into biography and history. Kulesh’s voice soars as always in the beguiling way that it does and the result we get is an album which is simple speaking an artefact. It gives voice to people who have faced what life has thrown at them and continued to fight back either through their deeds or their respect and love of family. 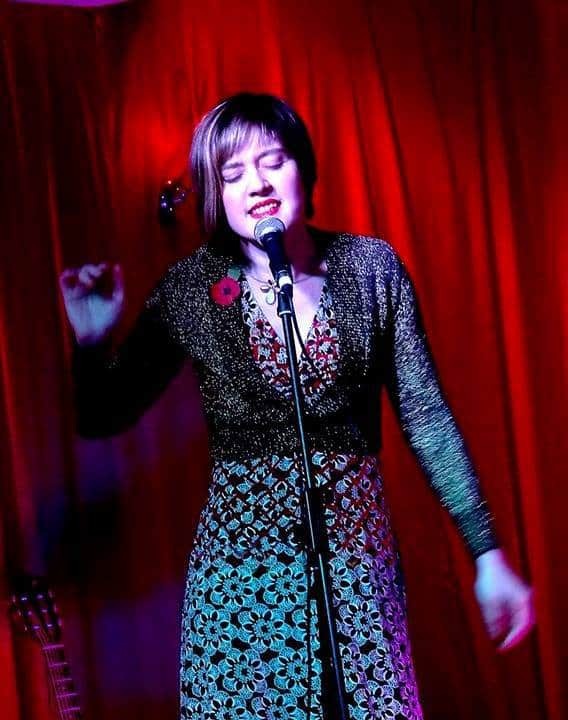 Give it a go, the album is launched 23 February at Cecil Sharpe House (see here), and the album will be available shortly after, keep an eye on Daria’s website here. Daria is also on tour, go here for her upcoming tour dates, see if she is touring near you!